They Call it the “Devil” in Milk?!!! Amazingly, 99.99% of all dairy we buy, even organic, has A1 Beta Casein in it. A1 Beta Casein is often referred to as “the devil in the milk.” It is the source of many health problems today. It is said to be 23 times worse than gluten! Diabetes, heart disease, schizophrenia – lurking in our milk? At first notice it seems preposterous, but Lincoln University professor Keith Woodford makes a case for these illnesses, and more, being linked to a protein in A1 milk, the kind that is consumed by most people in the Western world. The dairy products we purchase at the store are processed with high heat, using industrial shortcuts, and contains synthetic “nutrients.” In addition, the milk is pooled from hundreds of farms. Believe-it-or-not, conventional cows can produce 60-100 lbs. of milk a day. They are usually fed grain all day long. Cows are ruminant animals and were not created to consume grains. Cows are meant to consume grass and green food, not grain! Many nutritionists agree that conventional cows milk is not good for you when the cows are fed incorrectly. Even most “grass-fed” cows are given grain (moldy grain in many instances). Beyond Organic dairy has A2 Beta Casein in it. Why does that matter? There are different types of beta-caseins in milk that break down differently upon digestion, creating different biological reactions in the milk drinker. Many believe that people who are lactose intolerant have problems because of the improper way the cattle are fed. Those who have not been able to consume dairy products comfortably before may well be able to consume foods made from A2 Beta Casein without adverse digestive or allergic reactions. Additionally, A2 milk, cheese and yogurt are considered to be much healthier. 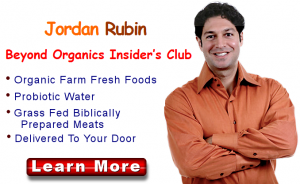 We are partnering with Jordan and giving you the opportunity to be among the first to try these amazing food products. Discover Beyond Organic for yourself. Questions? Call 918-458-1800. 0 Responses to "They Call it the “Devil” in Milk?!!!"